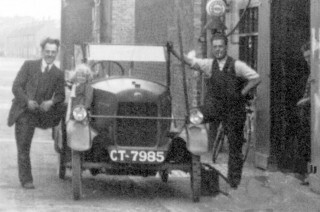 Christmas and Chorlton's garage on Bottesford High Street: Billy Christmas is standing in the doorway. 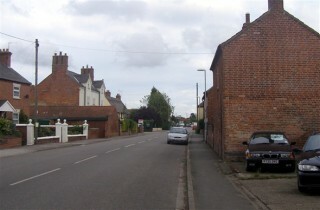 A contemporary view of High Street from Woodhouse and Carman's garage. William Ernest Christmas (“Billy”) was born in Queen Street, Bottesford 12 June 1892. His parents were Thomas Christmas, born in Cambridgeshire in 1851 and Martha Chapman, born in 1857 in Wrangle, near Skegness, Lincolnshire. In 1901 the Christmas family lived at New Station Cottages at the West End Bottesford. Thomas Christmas worked as a railway signalman. There were five children: Edith (18 – dressmaker), Clara (17), Arthur (15 – gardeners boy), William (8), Florence (6) and Reginald (5). The three youngest children were all at school. By the 1911 Census Edith and Arthur had left home. William, aged 18, still lived at home in South Station Cottages and worked as cowman on a local farm. 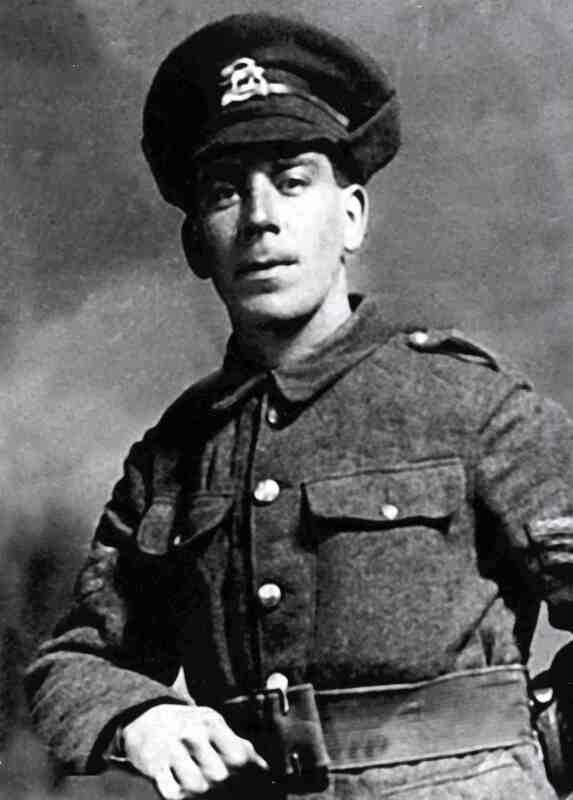 Billy Christmas enlisted with the 5th Battalion, Leicestershire Territorial Regiment on the 1st May 1914. Dr Martin, the local GP, signed him fit for service two weeks later on 15th May 1914. By then he was aged 21 and employed as a nurseryman with Mr Page in Bottesford. He would survive the war serving with both the 5th Battalion, Leicestershire Regiment and the 13th Battalion, The Tank Corp. A full set of service records in the National Archive document his service. Billy Christmas experienced front line action in Flanders, Arras and the Somme. Luckily his only injury was a ‘slight’ shrapnel injury to his thigh in September 1915. However life in the trenches would take its toll on his health and he experienced a series of admissions to hospital for up to periods of 3 weeks in 1915 and 1916 with various infections resulting from trench living. Perhaps all three were experimenting with improvised munitions. Sadly, soon after in October 1915, Leornard Barrand was severely injured and was sent home. He would never fully recover and died in 1919 aged 25 years. Billy Christmas told his son that he thought that might improve his chances of survival if he volunteered to train for the mechanised armoured section. He had seen a poster advertising for volunteers. His application was successful and he was posted on the 14th December back home to Machine Gun Depot at Woolwich for training with the Tank Corp at Bovington Camp in Wiltshire. There he joined the nucleus of men undergoing training to expand Tank Corp Battalions in France. Billy Christmas would serve as a Tank Mechanic Sergeant with the 13th Battalion. On the 31st January the Battalion entrained at Wool, Wiltshire near the Bovington Camp for Southampton. A total of 92 Officers and 632 Other Ranks made up the Battalion. On the morning of the 1st February 1918 they arrived at Le Havre on board three ships. From there they deployed to Bray on the Somme for battle training with the 5th Tank Brigade. Their stay was cut short when transferred to front line action on the Ypres salient in Flanders in late March 1917. After sustaining heavy losses they were withdrawn from what they described as ‘the dreary mud and dour inhabitants of Flanders’ to the divisional training camp at Mers-le-Bain in Picardie. Here they were re-equipped with the new Model V Tank. This superseded the Model IV that suffered from many design faults including being underpowered and difficult to turn. The Battalion would then serve in July 1918 at the Battle of Hamel on the Somme with the Australian Corp. In August they advanced across the Somme and would then join forces with the Canadian Corp and then again with the Australian Corp in the push west toward the Hindenberg Line as part of the the last 100 days of the conflict. By late October the expansion of the Tank Corp and the loss of trained mechanics necessitated a new approach to training, tank repair and maintenance. Trained mechanics were deployed back to the UK to form a specialist training division, the aim being to train tank crews to undertake running repairs and maintenance. Where previously Mechanist Staff Sergeants and Company Tank Engineers were technically advisers to tank crew in the field they had in fact undertaken many of the hands on tasks themselves. Their removal from front line duties to a Headquarters Inspectorate was a matter of ‘profound regret’ to the 13th Battalion (P.69 Battalion War Diary WO 95_115_2). Sergeant William Christmas was recalled to the UK for ‘duty with the Home Establishment’ in the 24th Battalion Tank Corp on the 16th October 1918. His return to home base duties would coincide with the end of the war. Billy Christmas would see no more front line service. His length of service qualified him for early demobilisation on the 26th March 1919. Whether Billy Christmas had enhanced his chances of survival by volunteering for the Tank Corp is a moot point. During the period of his service in France as a Tank Mechanic the 13th Battalion would experience intense front line action and consequent losses. By the November over 1400 men were listed casualties with the 13th Battalion. He put his war-time training as a mechanic to good use. With Sid Chorlton, he was one of the proprietors of the village garage named Christmas and Chorlton. Apart from car repairs and the sale of fuel, the garage also sold bikes. George Waudby recalled that he bought a bike from Billy Christmas, paying in instalments. When asked many years later by his son Pat Christmas whether he was religious, his only response was ‘where was God when I was in the trenches’. William Christmas died 19 October 1976 aged 83 and his wife Edith Annie died in April 1982 aged 83.